"The Landing of H.R.H. 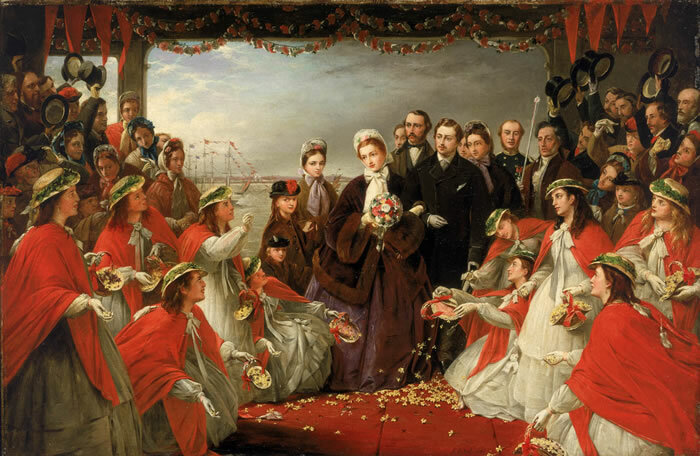 the Princess Alexandra at Gravesend, March 7, 1863," by Henry Nelson O'Neil, 1864. When Princess Alexandra of Denmark arrived on English soil in 1863 to marry the Prince of Wales, the heir of Queen Victoria, she was the very picture of modesty. No jewelry was visible and she wore a handmade bonnet. Alexandra may have been Danish royalty, but she wasn’t rich. Matter of fact, her family had lived on handouts to get by. She was shy, kind, and very beautiful. Everyone loved her immediately. 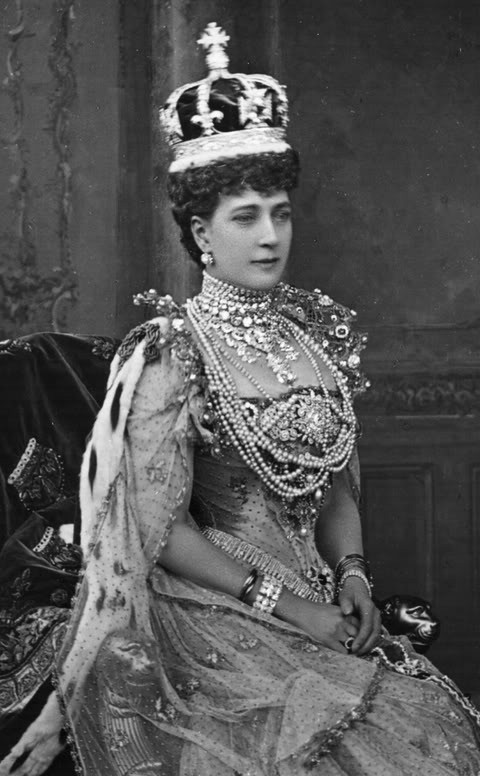 Alexandra discovered that Victoria had amassed an enormous jewelry collection. 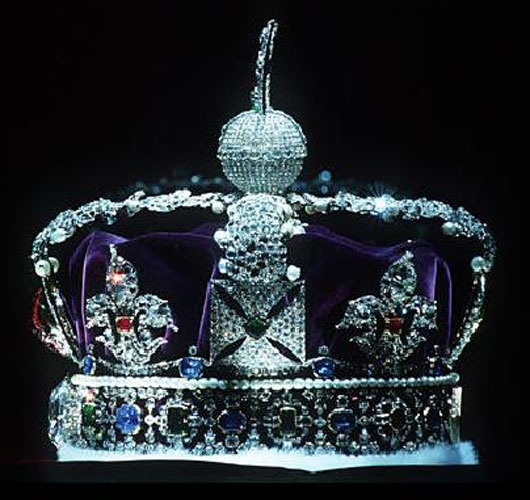 But, after Albert’s death, the Queen had became convinced that excessive display of jewels awakened anti-monarchial feelings in the English people. Princess Alexandra tried to convince her to wear her pretty, glittering things but to no avail. 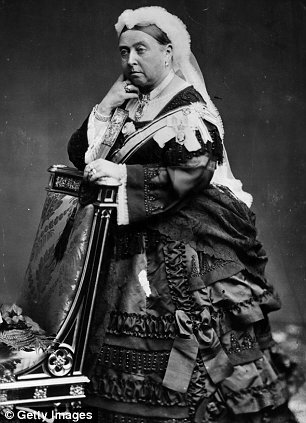 Famously, Victoria refused to wear a crown to the Thanksgiving service honoring her 1887 Golden Jubilee. The Queen of Great Britain arrived at the state ceremony wearing a bonnet. 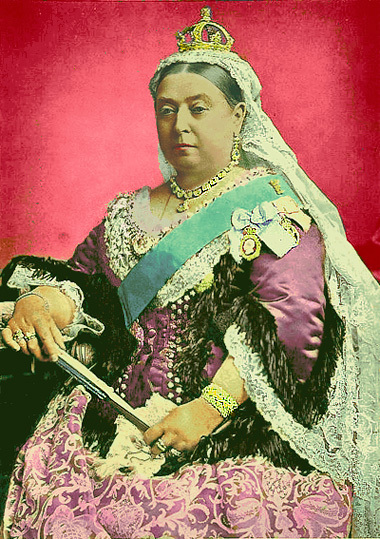 Whereas Victoria had renounced all pleasures, Princess Alexandra had just begun to live. She had grown up poor and now she was rich and the future Queen of England! She was not about to be sucked into Victorian mourning dress. Although her husband, “Bertie,” was a serial adulterer, Alexandra accepted his infidelity and got on with her life, moving with him from party to party with the artsy crowd. Dressing herself in fine jewels and frivolous clothes became her passion – and she indulged herself completely. 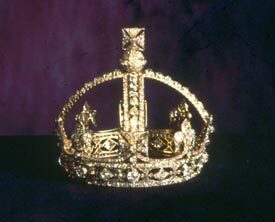 Readers: “Queen Victoria’s Tiny Crown” follows this post. In February 1952, Princess Elizabeth was touring Kenya with her husband Prince Philip, the Duke of Edinburgh when she received the bad news that her father, King George VI of Great Britain, had passed away. Thus, at the tender age of 25, Elizabeth ascended the throne to become Queen of the United Kingdom, Canada, Australia, New Zealand, South Africa, Pakistan, and Ceylon. She took the title Queen Elizabeth II although she was not a descendant of Queen Elizabeth I (1533-1603), who was the last Tudor queen. 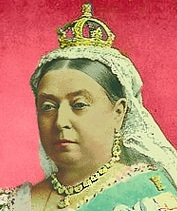 Queen Elizabeth II belongs to the Royal House of Windsor, formerly known as Saxe-Coburg and Gotha. During the Queen’s reign, there have been 11 U.S. presidents. Queen Elizabeth II has met every one of them except Lyndon B. Johnson. She met Harry Truman before she became queen and Herbert Hoover when he was a former president.